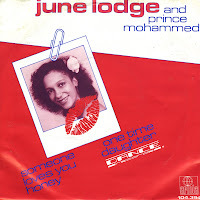 The biggest hit of 1982 in the Netherlands was 'Someone loves you honey' by June Lodge and Prince Mohammed. This reggae version of a country and western tune topped the charts in Jamaica and went on to chart all over Europe. Although the record was a big hit, it bankrupted producer Joe Gibbs, as he had failed to pay royalties to the songwriter. An album of the same name, featuring the deejay talents of Prince Mohammed was released in 1982.